Along with lots of hotel reviews, I’m excited to now be featuring a growing number of luxury airline reviews and flight experiences on the blog (so much so that they now have their very own section). 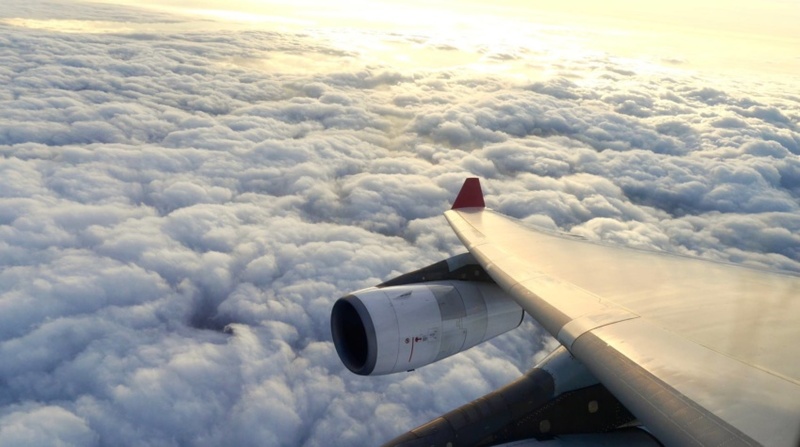 Flying is an important element of anyones travels and can really make or break an entire trip, so I thought that my tried-and-tested airline reviews would make for some great new content. 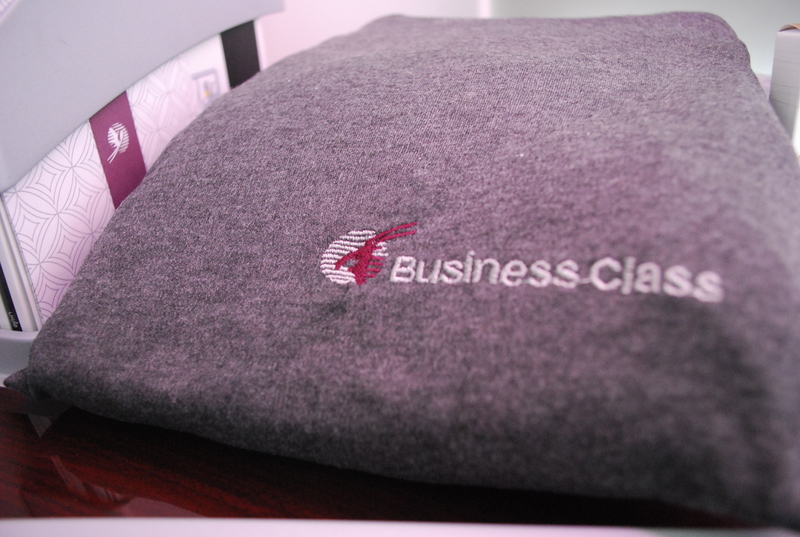 Qatar business class provided an all-encompassing luxury travel experience from the moment I stepped into the airport. Thanks to the dedicated first and business class check-in desk and security route, I was in the departure lounge in less than 5 minutes after arriving at Heathrow. It was the easiest check-in process I had ever done. On arrival at to the first and business class lounge, immaculately dressed stewardesses gave me a warm welcome, scanned my ticket and offered me a quick guided tour. 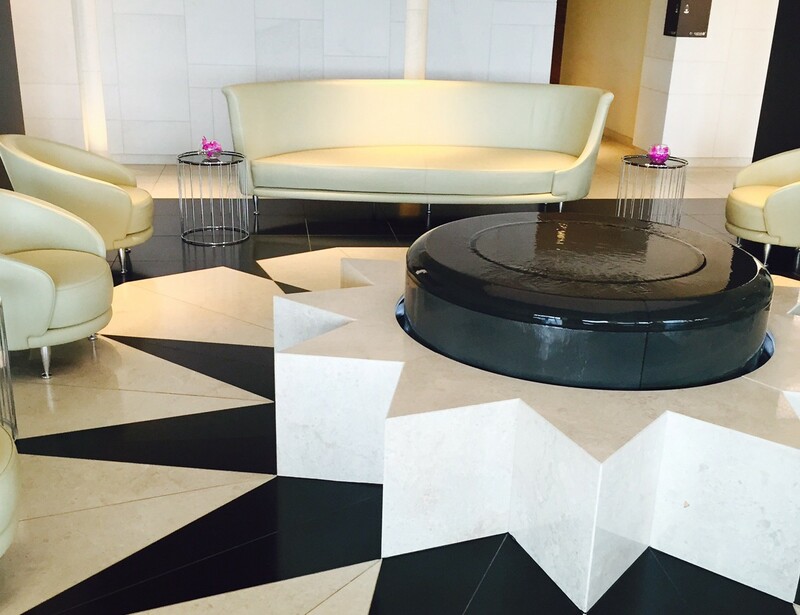 With perfectly polished marble floors, tessellating Arabic design and a calming water feature with a trickling fountain, the lounge oozed Middle Eastern luxury. It certainly felt a million miles away from Heathrow Airport. If you’re flying business or first, it’s well worth arriving at the airport with plenty of time to enjoy all the offerings in the departure lounge. Connecting travellers can also make the most of the lovely bathroom and shower facilities, which are easily at 5* hotel standard. 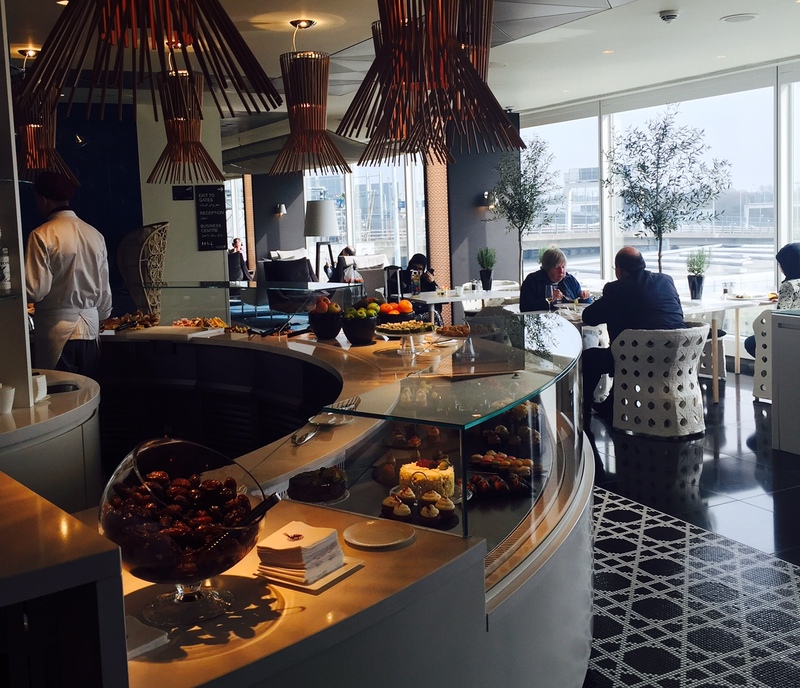 As our flight was around lunchtime, we decided to sample the dining options within the lounge. Travellers have a choice between relaxed buffet dining area or a more formal a la carte bistro. The buffet was full of fresh salads, breads, cakes, desserts and exotic Arabic mezzes (perfect for a light bite pre-flight). We combined the best of both by collecting a few mezzes as a starter and ordering off the A la Carte for main. The mezzes were beautifully fresh and authentic and my prawn linguine main was lovely. The bistro had a very premium feel and felt more like a chic central London restaurant rather than an airport departure lounge. Perfectly complimented with a glass of pink champagne (because, why not? ), it was almost time for boarding! As we stepped on board the plane we were welcomed by yet more immaculately dressed airline staff and shown to our seats. The seats were incredibly spacious and looked much more like first class than business. Each seat, or ‘pod’ was next to an aisle, which means no awkward climbing over anyone to get to the bathroom (fantastic). No sooner had I sat down I was greeted by my dedicated stewardess who offered me a hot towel and a pre-flight glass of champagne. I don’t tend to drink much during flights to avoid dehydration but it felt perfectly fitting to celebrate the experience with some champers, so willingly I obliged. Placed on the ledge beside each seat was a complimentary wash bag filled with lots of luxury goodies from Salvatore Ferragamo. Along with the perfume, hand cream and lip balm there were flight socks, a tooth brush, toothpaste, ear plugs and an eye mask. It’s these little luxuries that make such a big difference when travelling and truly add to the business class experience. One thing I couldn’t wait to sample was Qatar’s in-flight dining. After settling into my seat I had a look over the impressive 7-course A la Carte menu which was on offer to business class travellers. The beauty of the menu is that you can mix and match the courses to make your dining as light or as indulgent as you fancy. 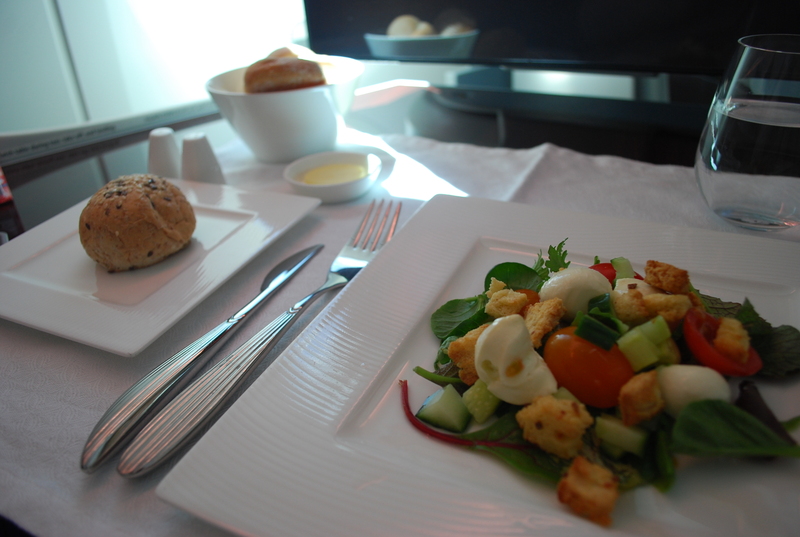 But the very best thing about Qatar’s in-flight dining is that you can order anything you like, whenever you like! Being able to order your food at any time was a huge luxury and something I had never experienced before on a business or even first class flight. It made the whole thing feel very bespoke because everything was at my own pace. As I had a big lunch in the departure lounge, I ordered my food about 4 hours into the flight and tried the mozzarella salad and lasagna. 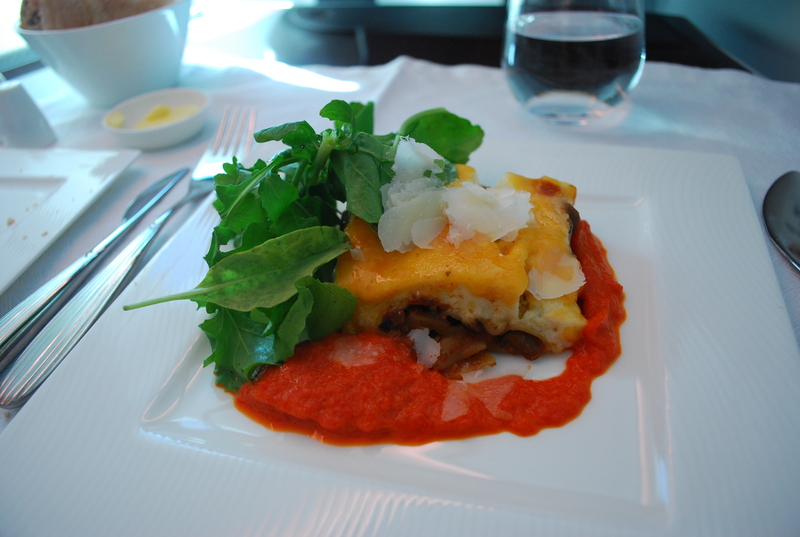 The lasagne was perfectly cooked and with the fresh sauce and garnishing, you’d never know it was prepared onboard a plane. The dishes were accompanied by warm bread and butter. An unexpected extra to my business class experience was the in-flight bar! The spacious bar area is situated to the back of the business class section and all drinks and snacks are also fully inclusive within the flight. It’s a great place to enjoy a drink, stretch your legs and be sociable if you are travelling with others. Across the bar are also additional snacks, cakes and cookies if you’re feeling peckish. Being business class, the seating provided the perfect environment for work as well as relaxation. The adjustable table came out far enough to place your laptop on with a reclined seat and (being the digital addict that I am) I absolutely loved that there was a plug built into the seat to charge phones and laptops. Once I had had enough of working, I reclined the seat even further and browsed the entertainment system. The personal TV screen was the biggest I had seen on any airline and there was a huge choice of blockbuster films, classic Hollywood movies, music and games. I picked out 12 Years a Slave to watch and was engrossed until my eyes got heavy and I reclined my seat back fully to sleep. The business class seats had so many adjustable settings that it would be impossible not to find a comfy position. A control panel adjusted all the separate parts of the seat. The fully extendable leg rest made the seating position incredibly comfortable, especially for sitting back and watching films. When I wanted to convert my seat into a fully horizontal flat bed, it was easy to do so using the same control panels. The chance of me sleeping on board a flight is always a bit hit and miss, but the plush surroundings of Qatar’s business class gave me a real fighting chance! The soft cotton duvet, down-like pillow creates a sleeping environment as close to home as possible and the eye-mask ensure minimal disturbance.They even give you comfy cotton pyjamas to change into, ensuring your clothes stay fresh for when you land on the other side. I managed to drift off into a deep and comfortable sleep for about 6 hours, waking up just in time for a light breakfast. It felt amazing to be able to kill so many hours sleeping and feel surprisingly fresh afterwards. This is the biggest benefit of flying business class for me. 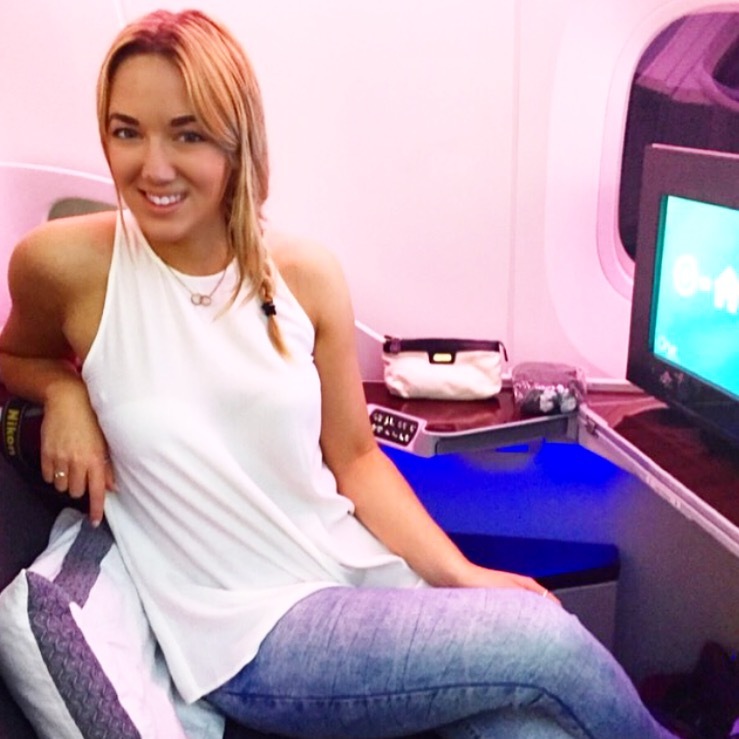 Having been fortunate enough to fly business class and first class with a few other airlines before Qatar, I had different flights to compare it with. Taking all these previous flights into account, I can honestly say that flying with Qatar has been the best business class experience I have had to date, and even trumps an upper class experience too. The service, airport experience, quality of the food, flexible eating times and dimensions of the seat puts Qatar’s business class head and shoulders above the rest and it’s no wonder that it won Best Business Class in the World two years running. Qatar Airways run daily flights from London Heathrow to Cape Town via Doha. Roundtrip prices start from £747 economy and £3122 Business Class. Book via 0333 320 2454 or visit www.qatarairways.com. Have you ever flown Qatar business on one of their 777 fleet? We are travelling business Per- Doha on a 777 then onward to London on the A380. The review of the A380 sounds amazing so was wondering if you had experienced the 777 also. 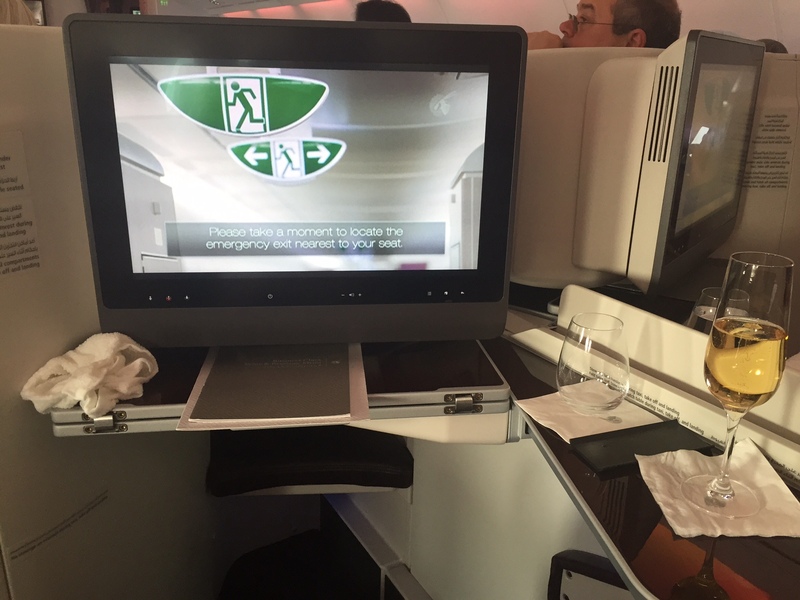 what is the flight experience in travelling economy class with Qatar from Singapore to Washington DC? Wow It looks sooo good!!! !, I have always travelled in tourist class, I hope that one day I can try it!! It all sounds and looks SO good! That on board bar is better looking than some of the grounded bars I’ve seen! Wow, This looks amazing. I’m even contemplating upgrading when I go New York this summer now. As I collect airmiles, I’m pretty loyal to British Airways but I love the look of this, it was the on board bar that got me! Wow! The Lounge looks amazing. The whole experience actually.